If you're having troubling using that huge Samsung phone you just got, you're not alone. The size of smartphones today make it increasingly difficult to use them with one hand. Recognizing that, Samsung developed One UI, a user interface that overlays the Android OS — called a skin — designed to make their smartphones easier to use. The One UI interface replaces the previous version, called Samsung Experience. As phones get larger, and phablets become the standard size for most successful smartphone designs, using them gets more difficult. Not only is the operating system more complicated than it’s ever been, but the actual physical form factor of the phone introduces roadblocks that make using the phone more difficult than ever. 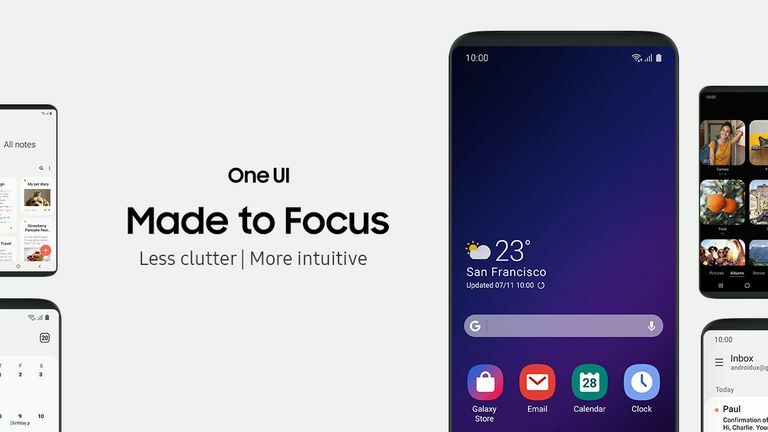 At a Samsung Developer Conference in November 2018, Samsung announced the One UI interface for its smartphones. The skin released to the general public on some devices in January 2019. According to a spokesperson for the company, the new user interface was created because “hardware and software must work together.” To make that happen, Samsung created One UI to be easier to use with one hand by redesigning how apps and functions display on the phone. First, the interface is cleaner than in previous versions. Clutter on the screen has been reduced to make it easier for users to find what they need. The way those functions and app display also changed. The biggest change is the screen on a Samsung device will be virtually divided into two sections: the viewing area, and the interaction area. The Viewing Area: The top half of the screen will be mostly reserved for displaying data and information. The display will be cleaner, crisper, and more viewable, and will make it easier for users to focus on the task at hand. The Interaction Area: The interaction area, which will be on the bottom half of the screen, is where users will perform most of the tapping and swiping needed to access and use menu and functions on the device. Together, these improvements mean no more stretching till you sprain your thumb so you can reach a feature in the top right corner of the screen. One UI users also won’t need to use two hands. It will be an easier, more intuitive one-handed operation, much like the experience users had before touchscreens became commonplace. In addition to the physical improvements necessary to make Samsung phones one-hand accessible, the One UI also improves usability by making the whole experience of using the device less distracting. Functions have been grouped together so the most used functions are displayed first, and anything you’re not using fades out of sight. What remains are Focus Blocks, which bring the most important content needed to focus on the task at hand, and presumably the content you want to see, front and center. The whole experience is further improved by the use of more rounded corners and a higher ratio of blank space around those Focus Blocks. Samsung is also added a Dark Mode to One UI designed to help reduce eye strain when using a Galaxy device in the dark. Users have long requested this feature, and as an addition to the usability of One UI, it's a welcomed one.